1907 In Chicago, an ordinance was passed by the city council to prohibit the exhibition of "immoral or obscene pictures" in mutoscopes, kinetoscopes, cinematographs, and penny arcades - it granted police permission to ban a film's release. It was required for a person exhibiting moving pictures to first obtain a permit from the chief of police for each film after it was reviewed and approved. 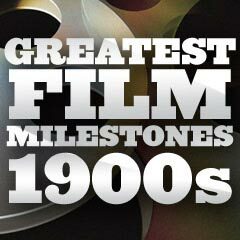 1907 The first film-makers arrived in Los Angeles. Filmmakers began to realize that the Los Angeles area was a good filming area with a favorable climate and a variety of natural scenery. The first movie was also made in Los Angeles soon afterwards (see 1909). Previously, movies were filmed in New York City and in Fort Lee, NJ. 1907 American Vitagraph (or Vitagraph Studios) had become the most prolific and leading American film production company, producing many famous silent films. 1907 The first feature-length (90 minutes) film produced in Europe was L'Enfant Prodigue (aka The Prodigal Son) (1907, Fr. ), directed by Michel Carré and shot at the French film production company, the Gaumont Film Company. 1907 Edwin S. Porter directed Rescued From an Eagle's Nest (1907), another Edison production. Richard Murphy created a mechanical eagle for this early film (starring future director D. W. Griffith in his first major screen role, after he failed to sell a script to the studio) - in the scene, a stuffed eagle with movable wings kidnapped a baby and battled the heroic father. 1907 The Kalem Film Company was founded in New York City. The Kalem Film Company's first film production was The Runaway Sleighbelle (1907). It soon became a member of the Motion Picture Patents Company, a trust or monopoly. 1907 The Essanay Film Manufacturing Company (Essanay Studios) was formed, later becoming best known for its series of Charlie Chaplin short comedies in the mid-1910s. Its first released film was An Awful Skate; or The Hobo on Rollers (1907) with comedic star Ben Turpin as the Hobo/Tramp (on roller skates), and directed-produced-written by Gilbert M. "Broncho Billy" Anderson. 1907 The entertainment industry magazine, Variety (founded in 1905), published its first film reviews on January 19, 1907, for two films: the Pathe comedy short An Exciting Honeymoon (1906, Fr.) and Edwin S. Porter's (and the Edison Manufacturing Company) western short The Life of a Cowboy (1906). These have often been cited as the first film reviews in history. The reviews, written by Sime Silverman, appeared in an expanded section of the magazine that covered new vaudeville acts and reviews of films. 1907 The Bell and Howell Company, founded by Chicago movie projectionist Donald H. Bell and camera repairman Albert S. Howell, developed a film projection system. Their firm went on to revolutionize motion picture photography and projection equipment. 1907-1914 The Broncho Billy series, with 400 episodes, popularized westerns. Gilbert Anderson became the first cowboy hero and perhaps the first recognizable character in American films.